What is it to be otherwise? For me, it suggests an alternative way of doing things. When applied to the museum, otherwise encompasses all the alternative ways of reconceptualising and destabilising an institution whose mission is to preserve the past, to maintain the status quo, to keep things as they are. Otherwise can also be rearranged and reread as to be wise about the other, bringing with it all that the term other implies. For me this interpretation of otherwise resonates with Bakhtin’s concept of the dialogic nature of discourse, ‘that no discourse exists in isolation but is instead dialogical, it is always situated between a self and an other’ (Bakhtin 1981, 134). 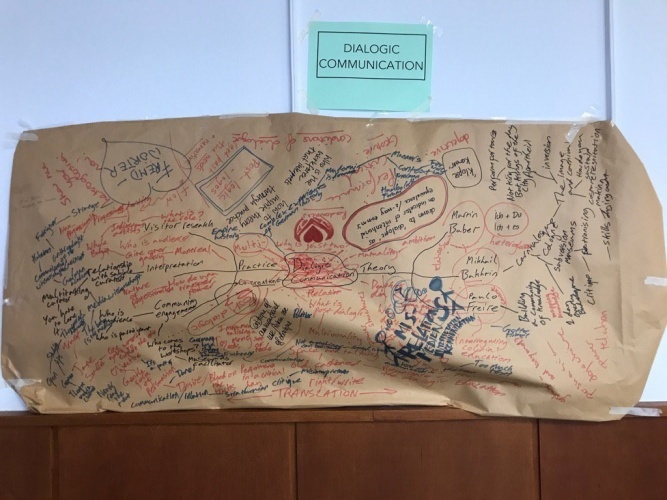 It was this idea of the capacity of dialogic communication to make us other wise that led me to suggest dialogic communication as one of the themes for the world café section of the CARMaH Museum Otherwise symposium. Practices concerned with facilitating a dialogue between the museum and its audiences, such as co-curation, interpretation and visitor research, have been commonplace in some, but not all, museums since the advent of the New Museology of the 1980s (Vergo 1989). However, the parallels between these practices and the developments in dialogic communication in literary theory, philosophy and critical pedagogy remain relatively unexplored. 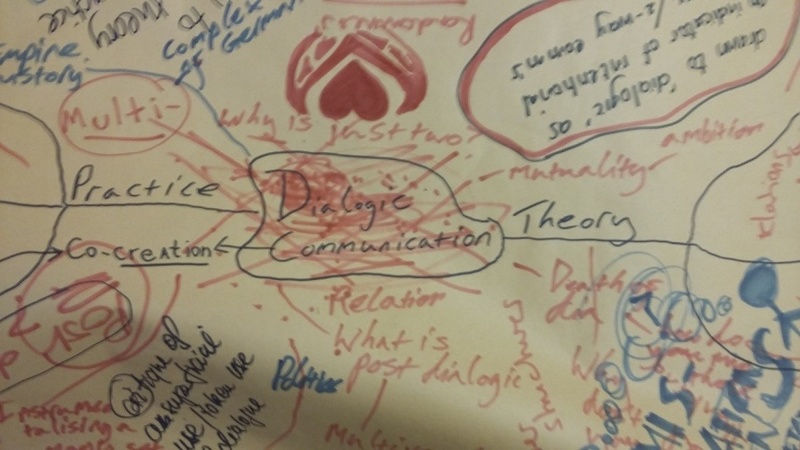 The term dialogic communication here provides me with a theoretical umbrella to group together theorists from different disciplines, including Mikhail Bakhtin, Martin Buber and Paulo Freire, who are concerned with how we, as people, understand our experiences and are constructed by, and through, acts of communication (Escobar 2011, 9). The work of all these theorists can also be seen as a reaction against the dominant concept of the self in western enlightenment philosophy as existing in solipsistic isolation (Christians 1998, 18). Buber’s famous maxim, ‘in the beginning is the relation’, can be seen as a retort to Descartes ‘I think therefore I am’, in its assertation of the primal nature of dialogue. Rather than our true selves existing in isolation from others, dialogue here can be seen as a kind of communicative primordial soup from which the self is shaped. Although everyone who works in museums, whether as practitioners or academics, tend to have a mix of practical and theoretical experience, one identity – theorist or practitioner – tends to dominate over the other. One of the dialogues I was hopeful of encouraging at the World Café was between those who fall further on the academic end of the spectrum and those who are located on the practical side. This resonates with Paulo Freire’s (1996) notion of praxis, which he describes as a process in which ‘reflection and action are directed at the structures to be transformed’. Praxis therefore occurs between, or across, the theoretical and the practical and, Freire argues, it is through a combination of the two that we are most likely to develop a critical consciousness. 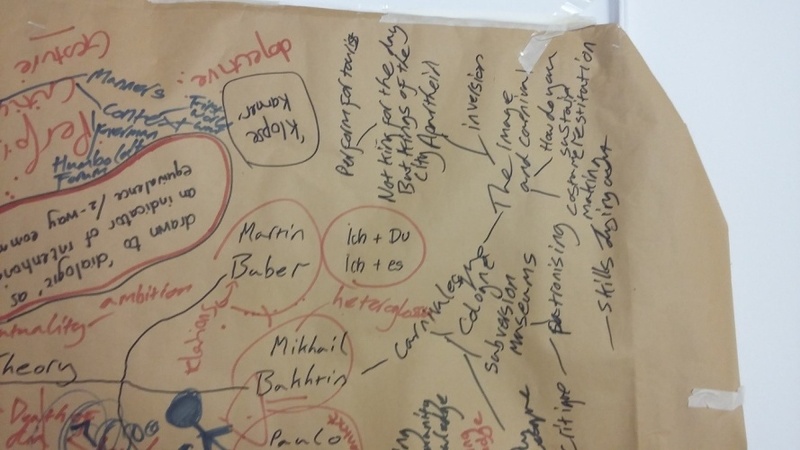 In writing up my experiences of the world café I was keen to capture, to use Bakhtin’s term, the heteroglossia of the symposium – the coexistence and conflicts generated by the inclusion of multiple points of view in a text that manifests itself in different forms of speech. Therefore, I include not only the discussions that took place at my table, but also the information and stories we were told on various walking tours that were ran as part of the museum otherwise symposium. Alongside this I also include, fragments of afterhours conversation I had with fellow conference members, as well as fellow drinkers, in the amber-lit, smoky bars of Neukölln. The World Café consisted of three discussion sessions each lasting for thirty minutes each. A large piece of brown paper was laid flat like a cloth on the table. I used this to make notes and capture the conversations, and participants were allocated pens and actively encouraged to write down their own notes during the session. 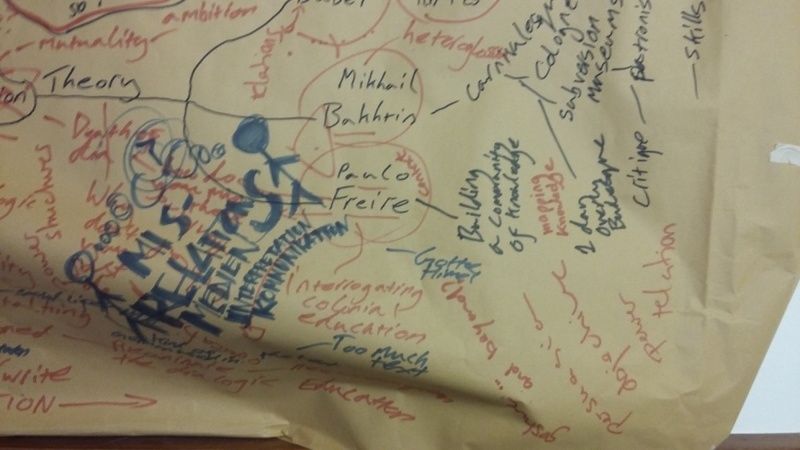 The completed World Café diagram after three sessions of discussion. Notes for session one were taken in black, notes for session two were taken in red and notes for session three were taken in blue. 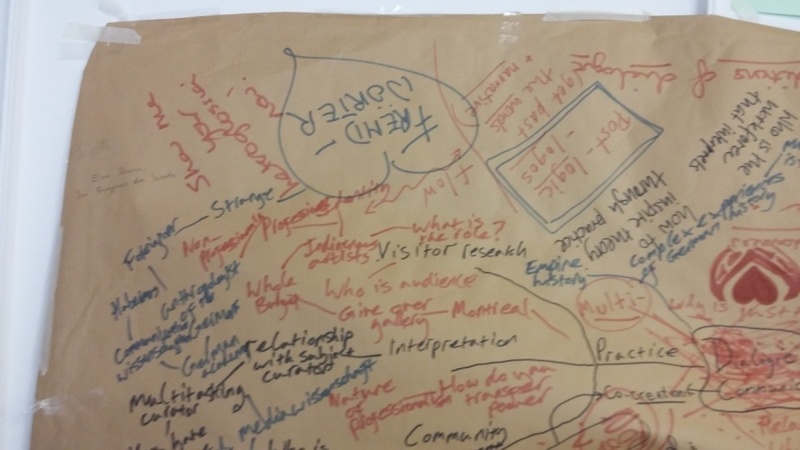 Before the dialogues began, I wrote in black pen my three key dialogic museum practices on the left side of the page: visitor studies, interpretation, and community engagement. On the right side, I balanced this with the three theorists I was, literally, bringing to the table: Martin Buber, Mikhail Bakhtin and Paulo Freire. My motivation for doing this was to both try and illustrate what and who I was grouping under the term dialogic communication, and to be direct about my own position in relation to these theorists and practices. This did, however, leave me open to the charge that in imposing such a structure I was not being very dialogic, an accusation the participants of session two exploited unmercilessly. My other attempt at imposing a structure was to change the colour of the pens for each session: black pens for session one, red pens for session two, and blue pens for session three, which enabled me and others who looked at the paper to allocate some degree of chronology to the discussions. On a walking tour of Berlin, the previous day, given by the NGO group Berlin Postcolonial we had been shown the various traces of the colonial legacy. One of these was site of the Berlin Congress of 1885 where Africa was carved up for colonial rule by European powers and where Berlin Postcolonial have successfully campaigned to erect an interpretation stele telling this history. The tour began and ended at Mohrenstrasse (literally Moor-Street), one of the streets Berlin Postcolonial campaigning to rename, and the street on which the building that holds CARMaH is based. As we traverse between sites, the tour guide talks to us about the recent surge in interest in colonial history in German Museums. They themselves have been involved in collaborations with museums, but these have not ended well. After initial positive exchanges, Berlin Postcolonial felt they were bringing about no real change in the exhibition, but were instead being used tokenistically to legitimise the exhibition. Relationships broke down to the point where they protested outside the VIP opening. Our guide who was originally from Tanzania told us that despite initial hopes of collaboration, once again it was white people deciding how black history should be told, ‘once again we are locked out of the museum.’ A potential collaboration with another institution in Berlin and Berlin Postcolonial were dismissed by our tour guide as impossible because they were so ideologically far apart. “Some friends you don’t need,” our tour guide told us. The discussions in session one were centred around community participation in museums and framed through Bakhtin’s concept of the carnivalesque. This is the literary trope that mirrored the medieval Feast of Fools in which the hierarchy of the world is turned upside down, fools become kings, and kings beggars. The critique of the carnivalesque, that it acts as pressure valve which maintains the status quo, can equally be levelled at community participation in museums. Discussions about the carnivalesque brought up an unexpected connection with the participants from Cape Town and Cologne – where carnival is a seminal moment for both in the cultural year. We talk about how community programmes can often resemble the build-up to the carnival: that the preparation can be laborious, expensive and time consuming and the part that is actually visible to the public is brief and transitory. The participants from District Six Museum talk about inverting this notion, of changing participants from being ‘kings for a day to kings of the city.’ Through their Klopse Kamer programme they invite local people to act as guides for tourists, getting them to perform the urban space and take ownership of the town. This is particularly important in a location like District Six, an inner-city area of Cape Town where more than 60,000 people were forcibly removed from the city and their houses bulldozed. Allowing participants to take over the city led to a discussion around the handing over of power and control. One of the participants from Berlin is drawn to the concept of dialogue and the notion of two-way communications as an indicator of ‘intentional equivalence’. Describing her own experiences within the Berlin Museumscape, achieving this two-way equivalence has not proved easy. Those who hold the power to talk about objects, traditionally the curator, are often reluctant to relinquish it. We discuss the difference between the curators of national museums in Berlin and those of the District Six Museum. Curators of social history museums are typically doing multiple jobs and do not act as custodians of iconic works of art, but everyday objects whose resonance comes from the stories of the people whose lives were once, and still are, intertwined with them. When working with objects in the museum, it is impossible to disconnect the objects from the former residents of District Six. Rather than retain the objects, the museum actually seeks to identify the object’s former owners and potentially reunite them with the object. The meaning that resides in these objects is therefore inherently dialogical. On the Friday of the symposium we are given a tour of the Humboldt forum. I do not envy our guide faced with the task of justifying the project to a party of academics who have spent the last week critically dissecting it. The building with its three sides of Baroque frontage and one side modern has, as our guide describes it “an Alice through the looking glass quality to it.” As he leads us through the skeleton of the building up unfinished staircases my head spins. It is a struggle to connect the palimpsestic layers of history and critique with the ineluctable materiality of hard hats, temporary sinks and Eastern European builders perched on palates eating their lunch. Talking about the visitor experience, he describes how large-scale images of star objects placed in the entrance hall will spark curiosity in the museums audiences – “we want visitors to taste the blood.” This phrase is meant to conjure up images of the visitor as predator, or culture vulture, tracking down its prey in the far corners of the gallery. But it also unintentionally hints at what Berlin Post-Colonial are so keen to expose: the blood that was shed when many of the objects were first brought into the museum collections of the city. In the second session, however, it is not the Humboldt Forum but me who is being critiqued. Most of the participants are academics and we begin by first cross-examining the term dialogue and then, when they’re finished with that, communication. Dialogue is deemed too ‘old-fashioned’, dia implying just communicating between two, ‘surely we’ve moved beyond that’. Various words with the prefix multi are suggested as an alternative: ‘multilogue’, ‘multivocality’ etc. Then co-creation is tried on for size. Nothing quite fits satisfactorily. The question remains, ‘what is the post-dialogic?’ Communication is also discarded. It’s regarded again as too traditionally one-way. The inclination to communicate anything to anyone at all being intrinsically suspicious, ‘shouldn’t we just leave people alone?’ Both terms are vociferously scribbled out in red pen and I am left hosting a table lacking a concept. The term dialogic communication crossed out in red pen by the table in session two of the World Café. Above can be seen the ‘heart-horns’ rebus inverted from the point of view of the person who drew it. After denouncing various forms of communication as being an inherently suspicious and altogether unpleasant undertaking we change tact. One of the table participants compares the act of communication to anthropological studies of gift giving. Just as a gift is never given freely, there is always something given in return. Perhaps then it is more honest to admit that we begin every dialogue from a position where we are trying to change the other person. That, as the academic suggests, when we have a conversation about which Dylan album is best – “blonde on blonde or blood on the tracks” – we are always trying to get the other to eventually accept our opinion. “Whenever you’re in trouble you go back to your friends Martin, Paulo and Mikhail”, responds the academic with a roll of the eyes. “Read Freud”, she sagely advised me. But not having the Interpretation of Dreams to hand I have to look it up later. A rebus, it turns out, is a puzzle in which words are represented by a hybrid of pictures and individual letters that transforms objects into ideas. Memories of medieval tiles with an oak and a Y-design flash into my mind. I returned to the table and stared at the former doodle, now rebus – a heart and a v maybe? I looked at it the right way round but was none the wiser. 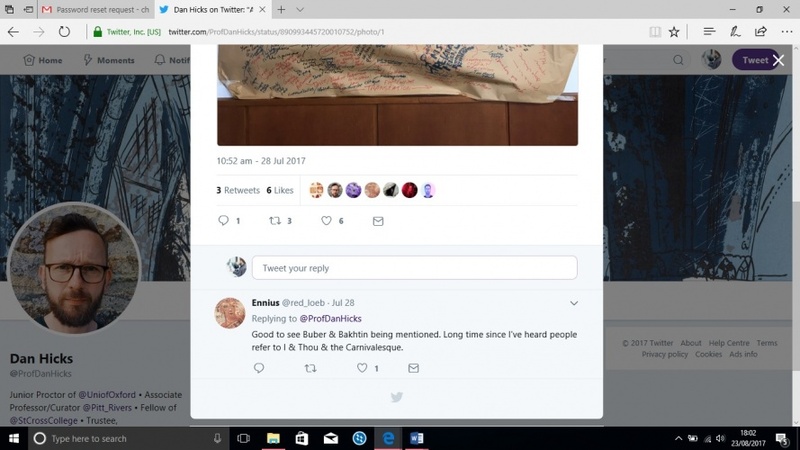 Was this the point she was trying to make it I wondered. What happens in a dialogue if we move beyond words, or if one of the participants of a conversation fails to translate what the other is trying to say? This idea of translation, of whose language we use, was a persistent theme throughout the workshop and would arise again in the final session. In the opening public lecture of Museum Otherwise one of the German audience members raises the issue of Anglophone dominance – “this is a conference hosted in Berlin but in which English is the main language of discussion?” This issues goes beyond the conference to the bars and cafes of Neukölln near the Airbnb where I’m staying. Everywhere I hear English spoken with varying accents – Californian, Mancunian, Melbournian. On the U-Bahn the recorded voice says, ‘mind the gap’, even though the thick rubber tyres mean there is little gap to speak of. Surely, Nietzsche’s ‘gaze long into the abyss, the abyss will gaze long into thee’, would be more appropriate. In a dark and dingy rockbar in Kreuzberg, as the Guano Apes play in the background, my German friend who now lives in London but is staying in Berlin for the summer, tells me stories of rapacious London landlords buying up rental properties and turfing out the German tenants. The Berlin rental markets, naively based on trust, is ripe for the picking by predatory English property barons who want to line their pockets with yet another Airbnb venue. A piece of graffiti on the street I’m staying in Neukölln reads, ‘Your money kills Berlin’. Is Berlin undergoing a period of Anglophone colonisation – the Anglo-Saxons returning back to Germany? I try and utilise my high-school German in bars and café to redress the balance, but my ‘ich mochtes’, ‘leckes’ and ‘danke schons’ don’t seem quite enough. In session three the focus was on the specific German museumscape and issues of translation and anglophone dominance suggested by the word Fremdworter. A word that translates as foreign word. Such Fremdworters are apparently banned from the Deutsche Historisches Museum. As I explain to the final participants, the concept of interpretation in UK museum and search for German equivalencies, I encourage the participants to write down German terms to counteract all the English on the page. One of these is Fremdwörter, which translates as foreign or strange words. Apparently in the Deutsche Historisches Museum, these Fremdwörter are specifically banned from labels as a measure to guard against the creeping Anglocisation of the German language. Another word added to the page is Medienwissenschaft (media science), I am told this is a specifically German subject that has led to German museums adopting a different approach to communicating with visitors than museums in Britain or North America. I enquire about what differentiates Medienwissenschaft from its anglophone equivalents like media studies, and I am told that Medienwissenschaft’s approach to knowledge is more embodied than its anglophone media study equivalents. Naturally, as things inevitably do in Berlin, discussion turn to the Humboldt Forum and we explore the question of whether the universal museum approach can be seen as a distinctively Anglo-Saxon form of Museology. This leads to a discussion about one of the triumvirate of directors Neil MacGregor and the exhibition ‘Germany: Memories of a nation’. This was first held at the British Museum in 2014 and then later in the Martin-Gropius-Bau but with the addition of the subtitle ‘The British View’. One of the participants argues that exhibition gives, equal balance to the Holocaust and the forced migration of German-speaking people after the Second World War and is potentially dangerous. She argues, that an exhibition that celebrates German history, culture and language is at odds with a heritage approach that confronts the most difficult and horrifying aspects of Germany’s past. I respond that when the exhibition was first displayed in the UK, it was held at a time of First World War commemoration and resurgent English nationalism. Britain was on the march to Brexit and the legacy of the First World War was being contested. This was a time when politicians like Michael Gove were arguing for the First World War to be seen as a justifiable conflict. Paul Cummins ceramic poppies installation at the Tower of London, Blood Swept Lands and Seas of Red, was the most popular heritage attraction at the year. The newly redeveloped First World War galleries at the Imperial War Museum included no voices from outside the years of the conflict, thereby omitting many of the criticism of the conflict by the likes of Wilfred Owen and Siegfried Sassoon. 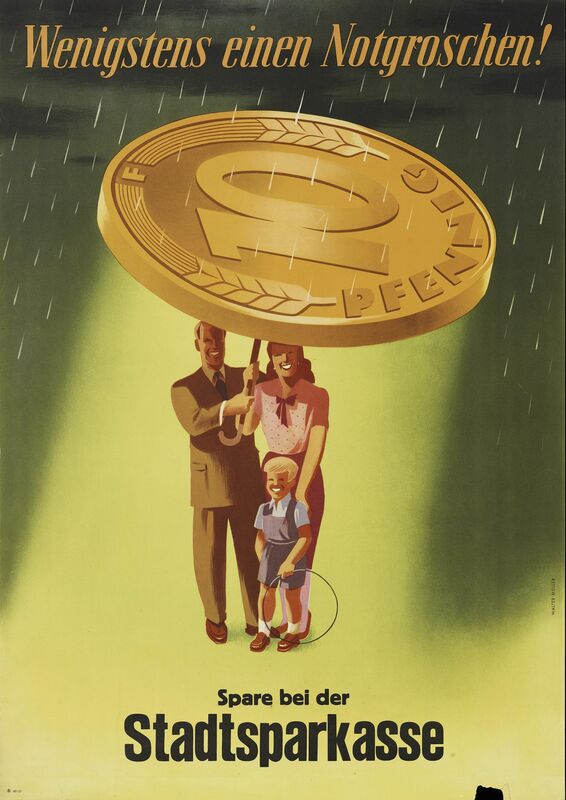 In this particular museumscape, Germany: Memories of a Nation can be seen as counterbalancing those in the UK who only view Germany through the lens of our shared twentieth-century history. Yet placed in the Martin Gropius Bau in 2016, all of this context is absent – if context is a term we are allowed to use. A phone alarm rings. The third session comes to an end. I thank the participants and then, once they’ve left my table, I slump forward, exhausted. Dialogue is productive and exhiliration, but also tiring. After finishing my bottle of water, I get up and look at the posters and diagrams created on the other tables. It’s interesting to see the contrast between other table hosts and my own. They’ve used a lot more post-it notes than me and are considerably neater. When I look at my friend Colin’s poster on the subject Hauntology, his is carefully organised in rows. The post-its precisely written in his own neat handwriting. ‘It’s like how differently our minds function has been illustrated on paper’, he quips. I nod, wondering if I could ever transform my messy scrawl into something so ordererd, and aesthetically pleasing. All our posters are photographed and then posted on twitter. Remarkably some of them attract comments. The only one for mine, by someone who goes by the handle Ennius reads, ‘Good to see Buber & Bakhtin being mentioned. Long time since I’ve heard people refer to I & Thou & the Carnivalesque.’ I am both flattered by getting a comment, and six likes, and also mildly insulted that my theoretical basis is deemed to be so retro. Still I wonder if this has something to do with the medium in which we’re working. That practitioners are some distance behind academics when it comes to the theoretical grounding. From another perspective, the application of these ideas to practical problems, theory acting as the moral compass of the practitioner, can give old ideas new life. This is I feel what makes the museum and museology such an exciting field in which to work. Not only is it somewhere where practitioners and theorists can be brought together in dialogue, one does not have to limit one’s self to one or the other. You can be both theorist and practioner. In this sense then dialogue is as much about gaining knowledge, or being wise, about the self, as it is about being otherwise. Bakhtin, M., 1981. The Dialogic Imagination. M. Holquist (ed), C. Emerson & M. Holquist (trans.). Austin, University of Texas Press. Freire, P. 1996., Pedagogy of the oppressed. London: Penguin Books. Vergo, P. (ed), 1989. The New Museology. London: Reaktion Books.